Crews rescued a trapped truck driver on Interstate 15 North near Carmel Mountain Road after the driver crashed into the center divide Wednesday morning. 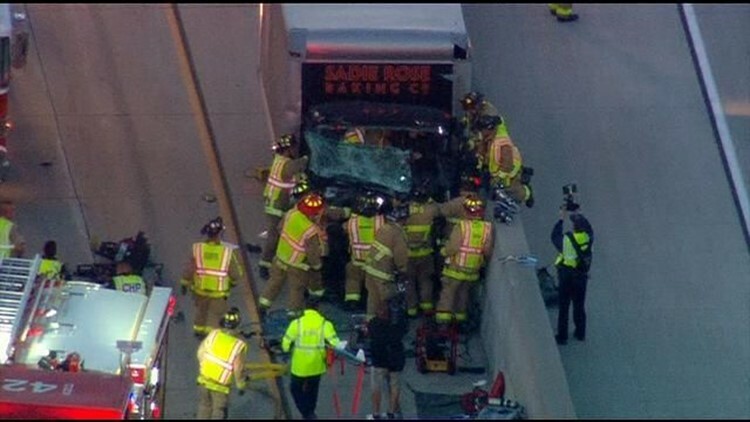 SAN DIEGO (NEWS 8) - Firefighters spent nearly an hour Wednesday morning freeing a badly injured man from the crumpled cab of the delivery truck where he was trapped following a freeway crash in the Carmel Mountain Ranch area, authorities said. Few details of the accident were immediately available, though it was reported at 5:21 a.m. on northbound I-15 near the Carmel Mountain Road offramp, according to the California Highway Patrol. About half a dozen fire engines, trucks, ambulances and medical rescue specialist teams were dispatched to the crash scene, according to a San Diego Fire-Rescue incident log. Once there, they found a man who appeared to be in his 30s trapped inside the crumpled cab of a Sadie Rose Baking Company delivery truck. Firefighters used saws and other power tools to free the man, who was pulled from the badly damaged cab just before 6:20 a.m. The injured driver was conscious and alert as rescuers loaded him onto a stretcher wearing a neck brace. A firefighter told a dispatcher that the victim sustained severe injuries to both legs. The two left lanes of northbound I-15 were blocked during the rescue, and Caltrans issued a SigAlert for the Carmel Mountain Ranch area. As of 7:30, all lanes were reopened to traffic.